Clay with some silt. No obstacles. "Brilliant fishing. great bailiff, Mark couldn't do enough for everyone. swims brilliant. facilities are good. 39 fish including 2x50lb+." "Our 3rd trip to Jonchery and was the best yet! Already booked to go next June! Thanks "
Jonchery is an extremely well-known lake. 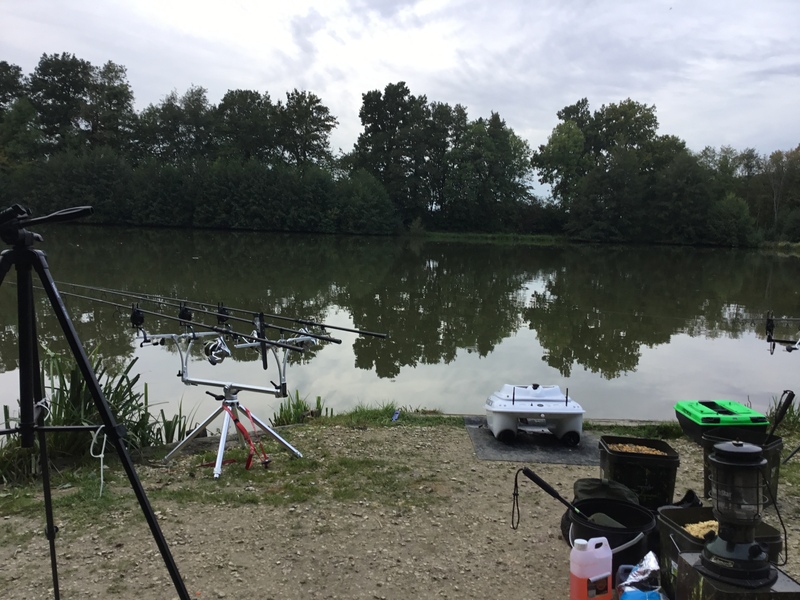 It is an established venue and has a reputation, built up over many years, as a water that is professionally managed, with excellent facilities and, because of its very healthy stock of big carp, it is a water that many anglers return to time and time again. It’s not just in the UK either that its reputation is know as this is a water that is very highly regarded throughout Europe. The whole complex is based around a fish farm and because of this you can be sure that the quality of fish in the water is exemplary. 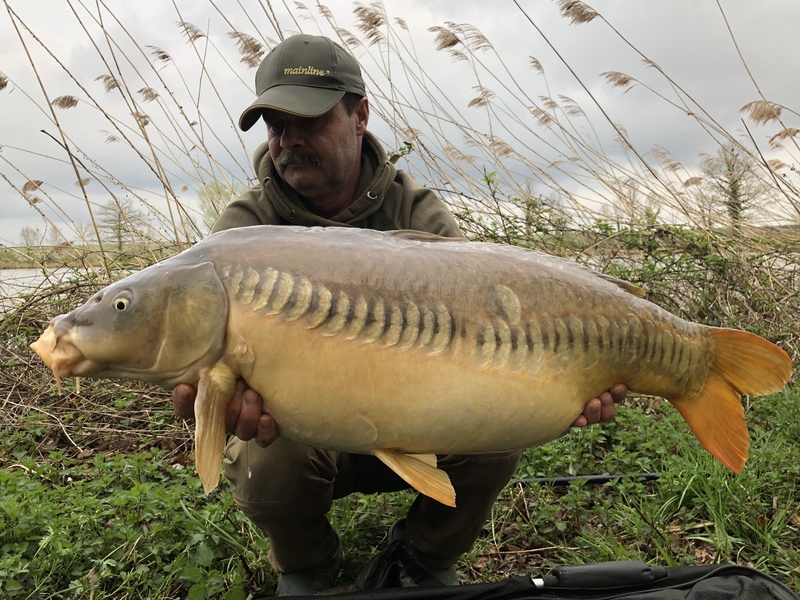 The water is run by UK fishery owner Mark Slade and his family, who live on site and there are around 450 carp swimming in its depths to over the magic 60lb mark. Being based around a fish farm for many years, Jonchery has been built up for ease of maintenance and so that the fish could be netted easily. In view of the this the bottom of the lake is flat with no snags or weed. With an average depth of around 1,2m the lake is quick to warm up in spring and, being open to the sunlight, stays warm well into the autumn months, meaning the fish move around for a lot longer than in some waters. Let’s take a walk around the lake to visit the swims. Swim 1 lies at the northern end of the lake, nearest to the entrance and whilst this is very convenient for the facilities there can be some disturbance from vehicles entering of leaving the venue. Swims 4, 6 and 3 are along one bank and lie in the shade of the afternoon sun so bear this in mind during hot weather. The water shallows up between swims 5 and 3 which is a good place to start earlier in the year as this area does tend to warm up quicker. Swim 7 is actually on the one of the small pools at the end of the lake. The lake bed is soft silt with harder clay patches and the deepest part of the lake is in the bowl around swims 1, 2 and 4 where the water is around 2m deep. Between swims 3 and 5 the water is around 1.2m deep. 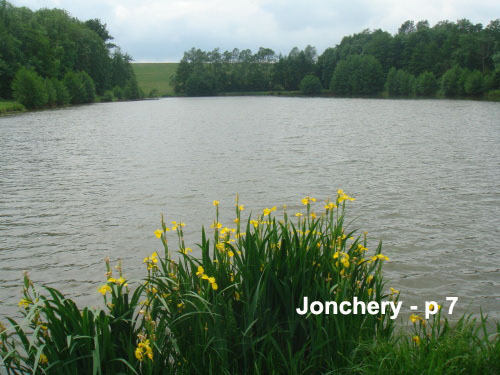 Jonchery is exceptionally well stocked with around 450 carp. There are some truly beautiful specimens of both mirror and common carp with dozens of 30s and 40s to fish for. The maximum size is around 28kg (approx. 62lb). There are 7 swims available, all of which are accessible by car for dropping off your gear. After this has been done cars are left in the car park near the entrance. There are also wheelbarrows available if you wish to move swims during your stay. Swims 1 and 5 are singles, the others are doubles. Swim 7 can be booked by three anglers so you can book this whole area of the lake exclusively if desired. The swims are clean, well prepared and several are built on pontoons so it’s best to bring some cup hooks to secure your bivvy down. Jonchery 7 - Want to catch over 150 fish in a week? Swim 7 on the small lake is a typical runs water where you can catch over 100 carp in a week. We even had clients who caught over 150 carp in 7 nights! 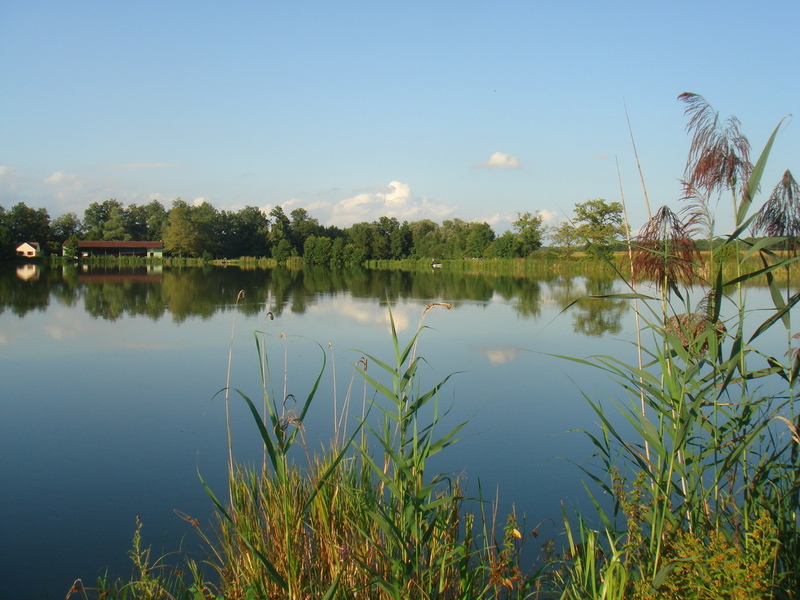 The owner restocked the lake and currently there are over 150 carp swimming in this 5 acre lake. You have to book it quite in advance, otherwise it is sold out! There is a separate building with hot running water, showers, toilets and a small kitchen area containing a fridge and freezer. There are ample power sockets for charging equipment and there is also a small dining area. The village of Brévonnes is only a short drive away where there are a couple of restaurants and shops. The good facilities and ease of access would make Jonchery an excellent venue for those who want to take a non-angling partner on the trip. 3. All anglers must pay a 50 euro refundable bond and ask to sign a contract to abide by all fishery rules. This is payed back on your departure. 5. Each angler MUST have a large container filled with lake water ready to pre wet mats and slings to minimise stress. Fish must be kept wet while out of the water. 10. Hooks must be no bigger than a size 4 and no smaller than a size 8. ALL hooks must be Barbless no flattening barbs . 13. All cars once unloaded must be places in the car park there is - No driving around the lake. 16. Each angler is only aloud to have quarter a kilo of tiger nuts. 26. The facilities are for every one's use so respect them and keep them clean after use .